NO LIFT, NO DRAG, NO BRAKE. SPACEBALL has an absolutely new game play combining a fast ball game and the flying of a spacecraft in 3D space. It is a game of smart guess, quick orientation in 3D, and swift reaction. The focus of SPACEBALL is not on the latest graphics gadgets but on the new game play which demands high dynamic skills and quick reaction and, therefore, results in a high replay value. Additionally, players learn how to handle a spacecraft in 3D and how to intercept a drifting object in a weightless environment. The player is located inside a vehicle, which can be rotated by attitude control thrusters and accelerated by one big jet engine at the back side. There is no lift, no drag, and no brakes. 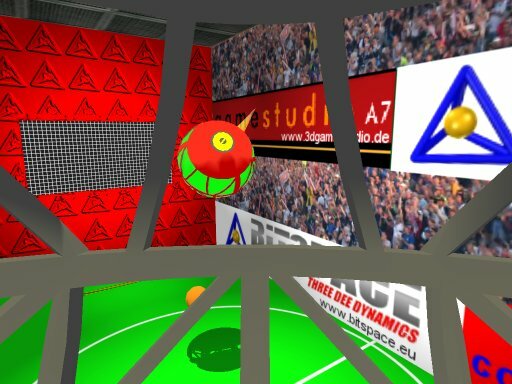 With this vehicle he will try to hit a drifting ball so that it bounces into the goal at the other side of the 3D playing volume. To achieve this, he has to maneuver to an advantageous position, estimate the future course of the ball, align the craft to the proper direction, apply controlled acceleration, and finally intercept the ball at the right spot. It is not uncommon, that one or two reflections at the walls need to be taken into account for the estimation of intercept point. In addition, interference by the other player has to be avoided. Special attention was payed to easy but realistic control of the craft in 3D space. Among other measures there is a control algorithm for the roll angle avoiding upside down flying and let the player concentrate on the interception task. The game is easily learned but difficult to master. 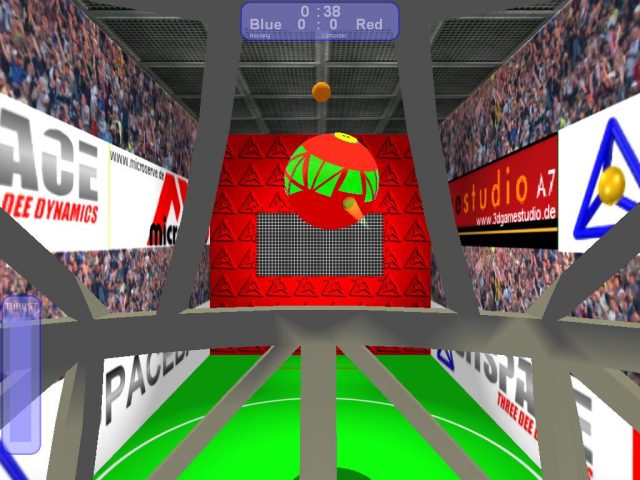 SPACEBALL can be played against the computer or against a human opponent in a local network or over the internet. For playing SPACEBALL, your graphics card should not be too old, it should have at least 32 MB of graphics memory and DirectX9(c) should be installed. The screen resolution is 1024 x 768 pixel. You can play the game with the keyboard, but it is far better to have a joystick or a gamepad. The files are zipped twice to avoid being blocked by firewalls due to containing an executable file (.exe). The trial version runs for one minute, only.